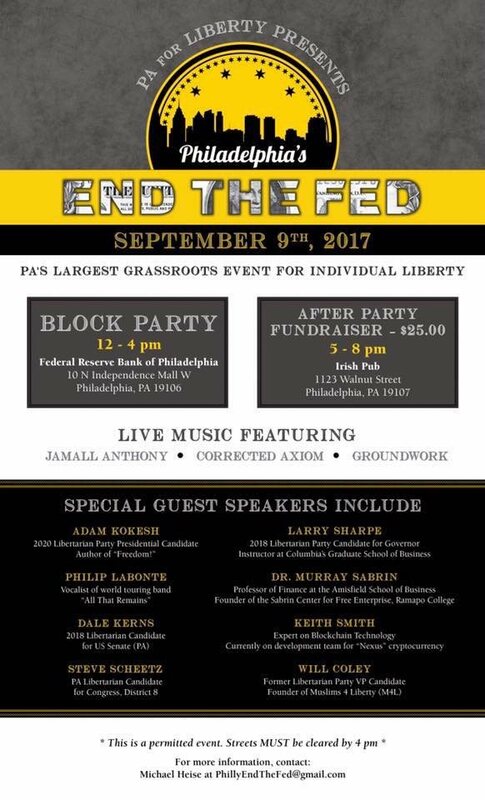 ALL THAT REMAINS singer Phil Labonte will be one of the featured speakers at "Philly End The Fed Block Party! ", a permitted, free and open-to-the-public outreach event primarily focused around the issue of the Federal Reserve System and "its detrimental effects on our economy." The event, which will take place on September 9 at the Federal Reserve Bank of Philadelphia in Philadelphia, Pennsylvania, will also feature food trucks that accept Bitcoin, a wide variety of vendors, and live music by three local acts. Other featured speakers include Keith F. Smith, cryptocurrency entrepreneur, developer of Nexus cryptocurrency; Steve Scheetz, 2018 Libertarian candidate for Congress representing Pennsylvania's 8th District, former chair of the Libertarian party of Pennsylvania; Dale Kerns, 2018 Libertarian candidate for Senate representing Pennsylvania; Will Coley, former Libertarian party vice presidential candidate, national director of Muslims 4 Liberty, host of "The Call To Freedom"; Adam Kokesh, longtime freedom activist, Iraq War veteran, author of "Freedom! ", 2020 Libertarian party candidate for (Not) President; Larry Sharpe, 2018 Libertarian candidate for governor of New York, managing director of the Neo-Sage, instructor and guest instructor at Columbia's Graduate School of Business and Yale University School of Management, respectively; Dr. Murray Sabrin, professor of finance in the Anisfield School of Business. The "Philly End The Fed Block Party!" will also feature live performances featuring both original music and some of your favorite anti-establishment songs by Jamall Anthony, CORRECTED AXIOM and GROUNDWORK. After the event, from 5 to 8 p.m., is "End The Fed Block After Party" with Dale Kerns and Larry Sharpe at The Irish Pub (1123 Walnut Street) in Philadelphia. This is a fundraising event for the Dale Kerns For Senate campaign. 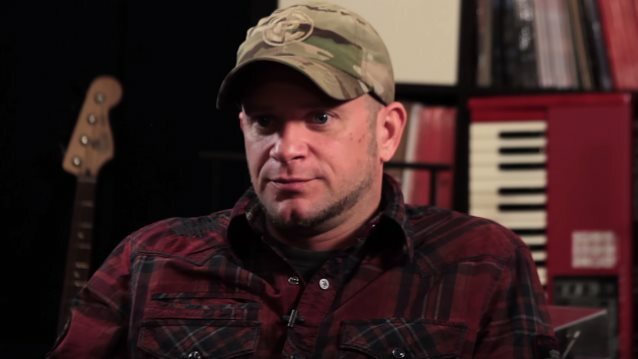 Labonte told Noisecreep in a 2012 interview that he considers himself a libertarian. He explained: "I believe that the government is massively expansive and has taken powers that it does not have. It should not be in the business of deciding who you should or should not be able to marry. It should not be in the business of deciding what drugs you can and cannot take and what you can put in your body. It should not be in the business of taking your money in the form of taxation. It should not be in the business of deciding if you should carry a gun. We don't need all these federal agencies that we have. They're a waste of money. They end up being bureaucracies. The government never ends up getting smaller. It only gets bigger. Once a federal agency is created, it never goes away. They don't need to spend as much as they do. We don't need to be in a hundred and thirty different countries across the world. We don't need a military as big as we have. If we took the army and cut it by ninety percent, that would be fine by me. I think we should we keep the navy that we have because the constitution does say that we should have a navy and if we took the naval power that we have now, we can definitely protect the U.S. and Europe. We have nuclear weapons. What do we need a standing army for? We can downsize the army to the point where it's just the rangers and the Special Forces and be done with it. We don't. If someone attacks us, we should retaliate with the most violent force imaginable, but otherwise we shouldn't be sticking our noses into other countries. We'd be much happier if we didn't. If someone attacks us — nuke 'em! [Laughs]"
Labonte added that he has never been afraid to state his opinion. "You get what you get," he said. "I hate when lead singers and people in bands are so afraid of offending their fans that they don't say how they really feel so they don't bum people out. Well, everything you do might bum someone out, so simply be yourself. I don't like rock stars. I didn't start playing in bands to get chicks. When I started playing music, there were no chicks to be seen. It was a sea of virgins. I'm not afraid to say this is my opinion. If you don't like, hit the road. What's the big deal? If I have an opinion, it's one individual opinion out of six and a half billion people on Earth. What does it mean? Absolutely nothing. So what if I said something that you don't like. It's not going to change the world one iota."